I raced five times during this month while logging 447 miles (an average of 14.4 miles per day) despite having issues with my calf and Achilles. On New Years day I took 2nd place at the Freezer Five. It was windy and cold on the out/back course which runs near the Sterling airport. I decided to push on the way out into the wind and Richard Bolt hung right behind me. He threw in a 4:50 mile from 3 to 4 miles that just buried me. Rich went on to win by nine seconds, 25:25 to 25:34. The next day Byrne Decker, Steve Peterson and I headed to Tewksbury for the Fudgesicle race. Byrne took the win in 16:44 with me one second back and Petey another 16 seconds behind. The following weekend I went to BU for the indoor track series. I doubled up in the 3,000 meters and the mile. Colin Peddie and I traded the lead off every 400 meters during the 3k and he took off in the last 400. I kept it close losing by less than a second in 8:36. An hour or so later I finished 5th in the mile in 4:31, with Peddie taking a second win of the day running 4:22. 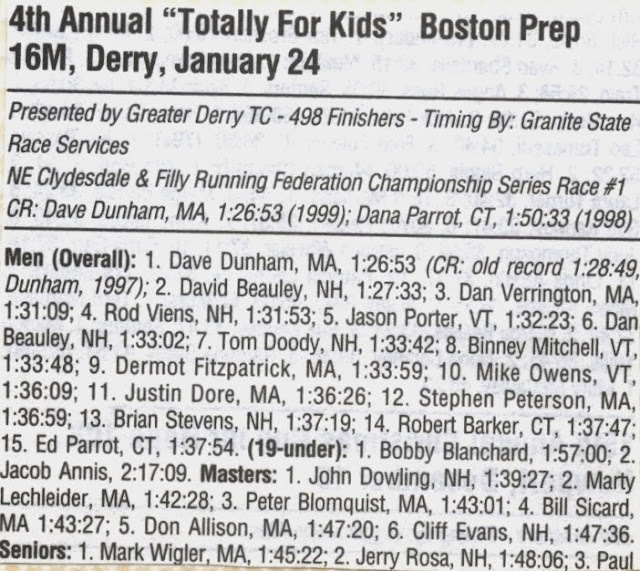 Two weeks later I ran my final race of the month, the Boston Prep 16 mile in Derry NH. Conditions were very good with moderate temperatures and a little drizzle and fog. 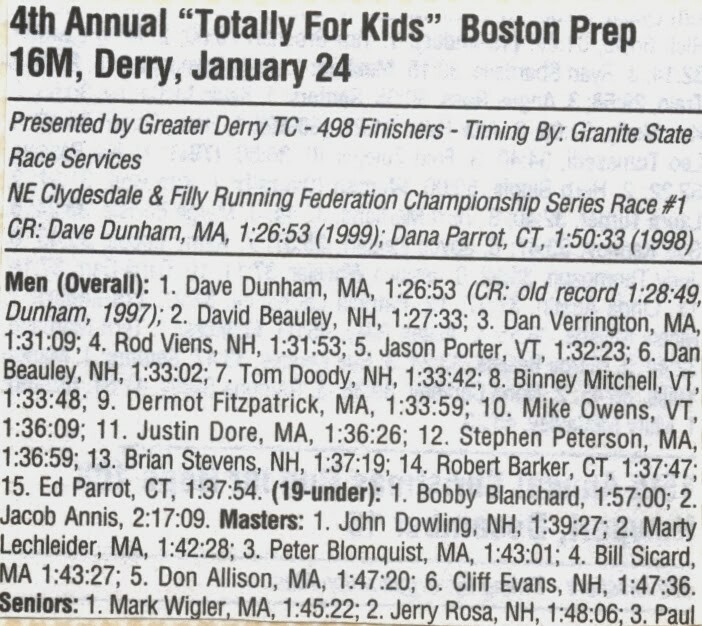 Dave Beauley and I ran lock stepped for the first 12 miles before I pulled away for a win in a then course record of 1:26:52. Beauley ran a 1:27 and my teammates Dan Verrington (1:31) and Steve Peterson (1:36) both had solid races.